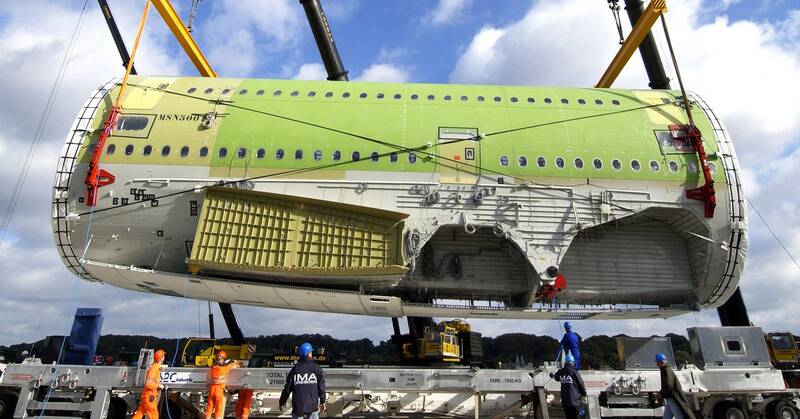 Many people will mourn the A380 jumbo jet, whose demise Airbus announced today. Perhaps none more than the residents of Lévignac, who rush to their windows and line the sidewalks when six articulated trucks, carrying the wings, fuselage, and other bits of the aircraft squeeze through the quaint French town on their way to Airbus’ assembly plant in nearby Toulouse. For most of its planes, Airbus moves such parts, which come from its plants in France, Germany, Spain, and the UK, by transport plane. The elements of the A380, though, are too big even for the whale-inspired Beluga. Instead, they move by sea and by river, a journey that Airbus calls the Oversize Transport Itinerary. And the streets of Lévignac are so narrow that getting those trucks through the town required a feasibility study by Airbus and the French government. It even produced a study called “Trailer truck trajectory optimization: the transportation of components for the Airbus A380.” That’s just to build the thing—actually flying it required rejiggering airport infrastructure. Getting people onto and off the plane requires dual boarding bridges (going to different levels). Some airports would have to widen taxiways; most would have to move signage around. Everything about the plane is huge: It’s 238.5 feet long and 262 feet from wingtip to wingtip. It’s seven stories tall. It contains 4 million parts and 220 cabin windows. All of which is to say, the A380 has always been a complicated machine, a feat of engineering, aeronautical as well as logistical. That’s because everything about the plane is huge. The double decker is 238.5 feet long and 262 feet from wingtip to wingtip. It’s seven stories tall. If you overlaid the A320 on the A380, the smaller plane’s tail just reaches to the jumbo’s wings. It contains 4 million parts and 220 cabin windows. In its standard 3-class configuration, it seats 517 people. You can fit 11 people in a single row. It is, as we said nearly a decade ago, awesome. Awesome, however, does not mean successful. The plane’s sales figures were as dismal as its specs are impressive. In 2015, Airbus took orders for just two A380s. In 2016, it took none. In 2017, it took none. Because the elements of the A380 are too big even for Beluga cargo transport, Airbus created a new route, called the Oversize Transport Itinerary.